There is no better way to enjoy Sydney in the evening than by taking a comfortable dinner cruise around Sydney Harbour. These river cruises provide a 3-4 course meal and travel past many of Sydneys famous landmarks; including the Sydney Opera House and the Sydney Harbour Bridge. Many dinner cruises provide a delicious multi-course meal for patrons as well as a number of included alcoholic or non-alcoholic drinks. Beverages include a premium selection of red and white wines, sparkling wines, beer and basic spirits. On these cruises, you will enjoy carefully prepared meals by an experienced chef including tasting plates, mains and dessert platters. Vegetarian options are available, as are chicken, beef and fish dishes. One of the best ways to do this is to book for a Sydney Harbour Sunset Dinner Cruise. Watch as the city’s skyline comes alive with lights at dusk, all the while aboard the prestigious MV Sydney 2000. What’s more, you have the perfect chance to catch the sun’s evening glow before it sets to usher in the night. This cruise lasts around 90 minutes. You could also take the Sydney Harbour Cruise and glide around the city’s beautiful attractions – from the well-lit Harbour Bridge to the Opera House and the iconic Circular Quay. You will then settle down to enjoy a delicious 3-course meal prepared using the freshest ingredients. Dig into your meal with excellent views from the table and the soothing sounds of live entertainment on board. 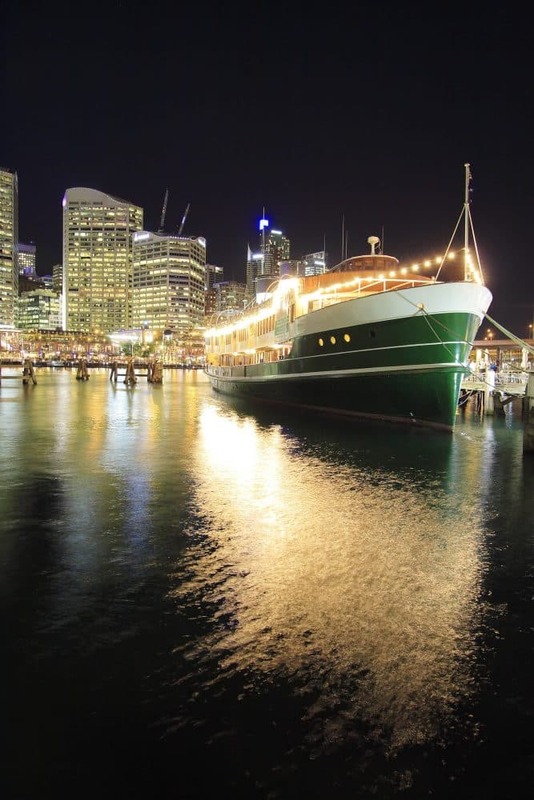 One of the highlights of Sydney’s dinner cruises is the Retro Cruise on the Sydney Harbour. This old school dining experience will have you tapping your feet to hits from the 70s, 80s and 90s while enjoying a classic 3-course buffet meal. Take an unforgettable Vivid Sydney Buffet Dinner Cruise and treat yourself to the city’s most spectacular views. The cruise highlights includes a buffet cocktail dinner, stunning works of art on the Harbour Bridge, as well as excellent photo opportunities as the city lights up at dusk. With a refreshing and varied menu to choose from, there is something for everyone to enjoy. Treat yourself to the Latino Dinner Cruise on Sydney Harbour. As you marvel at the dazzling landmarks that Sydney is home to, you will also be munching on a delicious buffet dinner with beautiful live music and dance in the background. These dinner cruises are a spectacular way to enjoy Sydney in a nutshell, so click the link below to explore the full range of dinner cruises available.